One of the really cool things about patch birding is that certain territorial birds like Great Horned Owls may become individually recognizable. That is kind of how it has been for me in the Boise foothill community of Avimor. 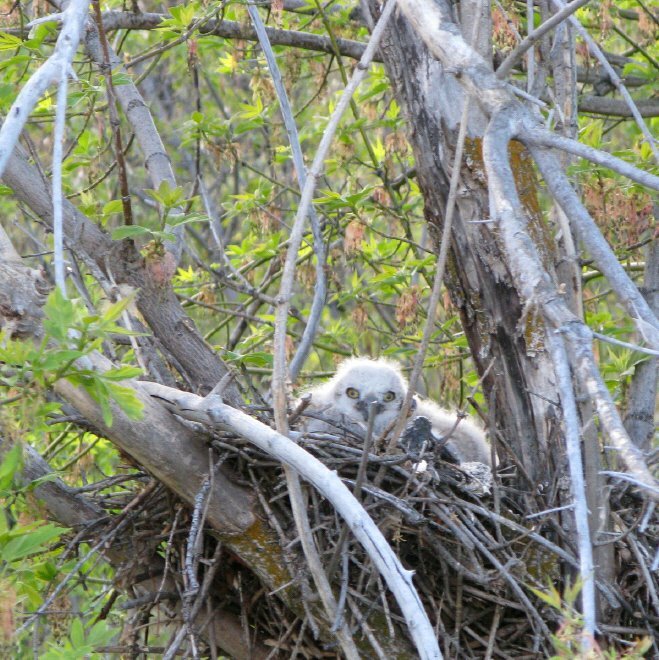 Over the last few years at my birding patch, I've nest watched, owlet watched, and I've become familiar with the favorites daytime roosts. I've seen a couple of my Great Horned Owls dead on the side of the highway and wondered if it was someone I knew, but have been too troubled by the thought to actually check out the corpse. Yesterday afternoon while driving out of the neighborhood after doing some work there, I saw this very small Great Horned Owl, with darker than usual coloration. This was the first time I'd seen this guy. I call it a guy, assuming that it is a male. 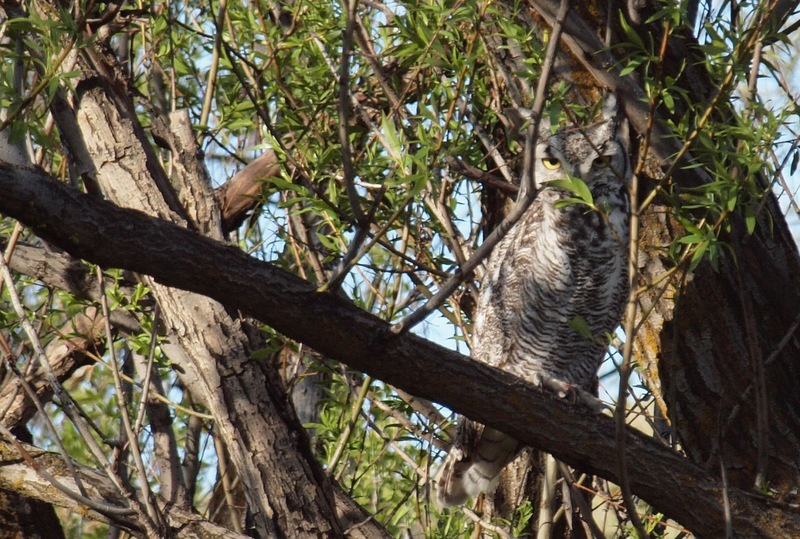 Male Great Horned Owls are known to be substantially smaller than females. At first, I almost thought this was a Western Screech Owl he was so small. Something else that has helped me get more photos of my Great Horned Owl friends is the Swarovski ATX Spotting Scope. I'm able to digiscope close-up images when in fact I am a considerable and non-intrusive distance away. Sure, the owl knows I'm there, but I've never flushed one while photographing...only by accident hiking through an area I didn't expect to find one. 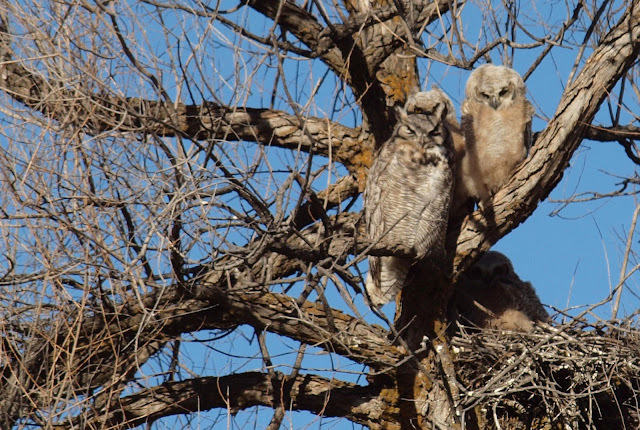 Below is the first Great Horned Owl nest I watched at Avimor. 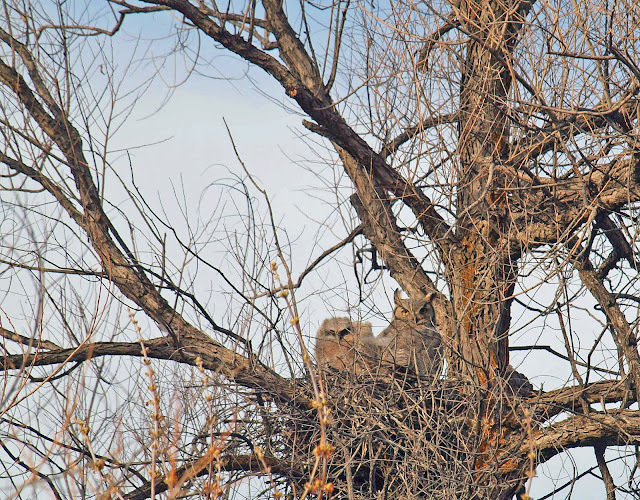 The nest was just above eye level and just feet away from the paved trail. I was surprised that they nested there, but a couple of young owls successfully fledged from it. Right at the entrance to Avimor, there is a bridge over a stream with large stands of cottonwood trees. 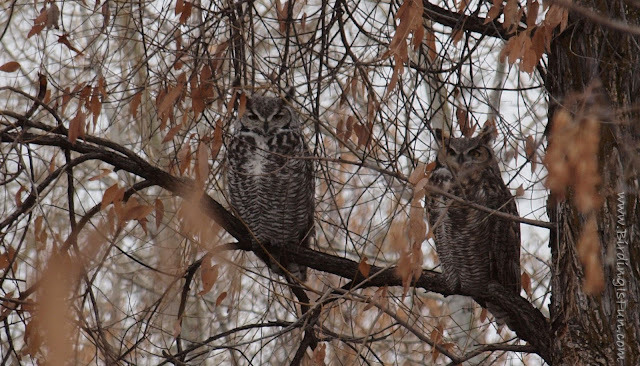 Great Horned Owls have nested in one particular tree a couple of times during my period of observation. One year I observed a very light colored Great Horned Owl with white and black zebra striping and very little to no brown colors. Alas, it was only around but for one year. It's plumage was very distinctive and recognizable. The white Great Horned Owl and mate a couple years ago. The owl I have seen most consistently this past summer, fall, and winter is pictured below and I think is the same owl on the right in the picture above based on the color pattern. The facial disk coloration also seems to vary between individuals and has helped me recognize them. I've also had Juncos with all white tail feathers, House Finches and Mourning Doves with a unique and individually recognizable traits. Do you have recognizable individual birds in your patch or even in your backyard? If so, which species and what about that bird make it recognizable to you? Spot patterns on Spotted Towhees do this for me. Also, I have one Steller's Jay with a gimpy toe. I enjoyed the post. Thanks. Owls about that then. Very cool. Inversely, I wonder if the owls recognize you as distinct from other people passing through?